Mission Veterans quarterback Landry Gilpin (12) runs through the Harlingen High defensive line during the teams' season opener Thursday, Aug. 31, 2017, at McAllen Veterans Memorial Stadium in McAllen. McALLEN — Tom Landry Stadium in Mission may be under construction, but that didn’t stop another Landry from unveiling a successful renovation of the Patriots offense. 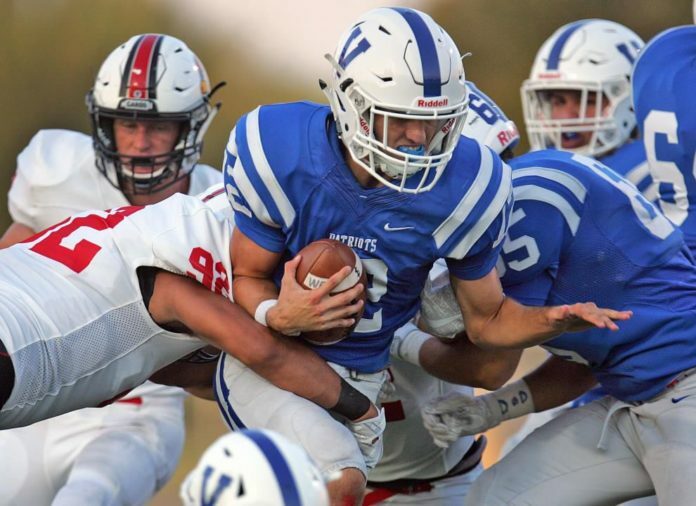 Junior quarterback Landry Gilpin threw for two touchdowns while running for another one on the ground to help Mission Veterans (1-0) down Harlingen High 31-26 at McAllen Veterans Memorial Stadium. Thursday night was Gilpin’s first start at quarterback since his freshman year. The season-opening jitters got the best of both teams early in the first quarter. Mission Veterans won the toss and fumbled on its first possession, and Harlingen High followed by turning the ball back over to the Patriots. After recovering Harlingen High’s fumble at their own 9-yard line, Landry Gilpin took the snap and scampered down the left sideline for a 91-yard touchdown run with 4:44 left in the first quarter. In the second quarter, after recovering Harlingen High’s third fumble of the half, Landry Gilpin took advantage of the short field and found senior wide receiver Buda Gonzalez for an 8-yard score to put the Patriots up 14-0 heading into halftime. Harlingen High made its presence felt in the third quarter. Senior quarterback Daniel Ramirez found fellow senior Riley Sauceda for a 45-yard touchdown catch and run to get the Cardinals back in it, down 14-7. Two possessions later, the Patriots got a 24-yard field goal by senior kicker Agustin Rodriguez to go up 10, but the Cardinals answered with a rushing TD by running back Ralph Castellanos to cut Mission Veterans’ lead to three. Landry Gilpin started the fourth quarter with a 79-yard touchdown throw to sophomore wideout Mikey Garcia to build a 24-14 lead. Another sophomore, running back Danny Cantu, added a 55-yard run to stretch the Patriots’ largest lead of the game to 17. The Cardinals marched back with two touchdowns and two failed two-point conversions but couldn’t get any closer. Harlingen High (0-1) dropped its first season opener in the Valley since 2012. Landry Gilpin finished the night with 188 yards on the ground and another 117 through the air. The improved Patriots defense was starting to bend toward the end of the game but held firm. Senior defensive back Aaron Fernandez accounted for the only interception of the night, picking off Daniel Ramirez late in the first half. Fernandez was seeing his first game action since tearing his right ACL in a district game against Sharyland High last October. The Patriots will line up next against Mission High in the Battle of Conway at 7:30 next Friday night. The game will be played at Bennie LaPrade Stadium in Donna.